Who knew the egg dying kits we grew up using every Easter were full of icky chemicals! We never thought to look, but when we did, we didn't like what we saw. Sodium lauryl sulfate?! Ew! 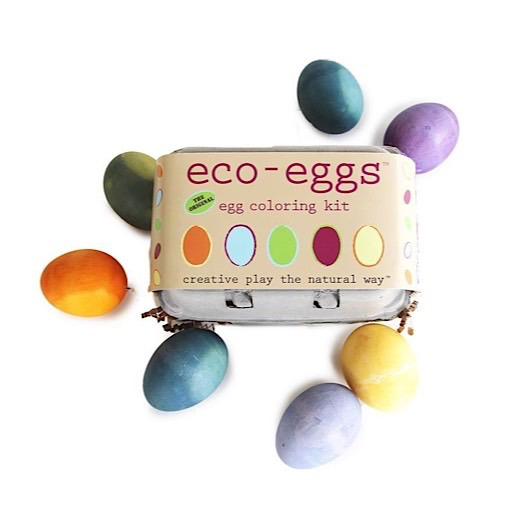 Luckily, Maine company Eco-Kids created this all natural eco-eggs coloring kit! Kit comes with 3 primary color powder dye packs with a color chart so you can learn to make your own shades. Also includes fun stencils and texturing tools. You'll have the prettiest and safest Easter eggs you've ever made! Made in the USA with natural and organic fruit, plant, and vegetable extracts including purple sweet potato and red cabbage. Instructions included.